Battling through the ages for love’s sweet spark. Juliet Capulet didn’t take her own life. She was murdered by the person she trusted most, her new husband, Romeo Montague, who made the sacrifice to ensure his own immortality. But Romeo didn’t anticipate that Juliet would be granted eternal life as well, and would become an agent for the Ambassadors of Light. For seven hundred years, Juliet has struggled to preserve romantic love and the lives of the innocent, while Romeo has fought for the dark side, seeking to destroy the human heart. Until now. Now Juliet has found her own forbidden love, and Romeo, O Romeo, will do everything in his power to destroy their happiness. Anyone that knows me knows that I am madly in love with both William Shakespeare and strong female characters. Shakespeare writes many strong female characters into his works but in my opinion Juliet Capulet is not one of them. Many of you are thinking of the way in which she defies her family to be with her one true love and when she finds him dead she takes her own life, defiant = strong, right? Wrong! Eek, Willie you had me up until that point…though I can imagine the grief and utter loss Juliet felt at seeing Romeo dead I can’t help but want to slap her in the face with some reason! You are on the brink of womanhood! There are other fish in the sea! “There’s a shortage of perfect breasts in this world. It would be a pity to damage yours.” (Princess Bride, anyone?) But alas, I was not there to slap some sense into young Juliet so she falls dead by her own hand…or does she?! 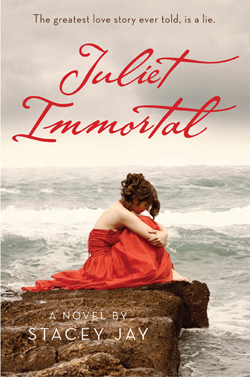 Juliet Immortal is a completely warped and amazing tale of Romeo and Juliet in which Juliet does not die but is killed by Romeo to ensure immortality and entrance into the Mercenary ranks as an emissary of darkness. Romeo’s plan is thwarted however when Juliet is also granted an immortal life in which she spends eternity as Romeo’s enemy. Their assignments puts them into the bodies of two mortals on earth, Romeo’s job is to convince lovers into killing one another, while Juliet is there to ensure that they remain in love and eventually reach the point of “true” love. This assignment is different from the moment Juliet, trapped in the teenage girl Ariel’s body, meets Ben. Juliet fights her nearly overpowering feelings for Ben because she soon finds out that the two lovers she is meant to save are Ariel’s best friend Gemma and her new boyfriend, Ben. Meanwhile, Romeo is going out of his way to try and woo Juliet and it seems that he really does love her despite his crazy. He senses something is different about this trip as well and does his best to warn Juliet of impending danger. She attempts to stick to her mission until her feelings for Ben take over and she has no choice but to let true love take over. This eventually leads to a pretty awesome ending that I kind of saw coming, but loved anyway. The author totally rewrites the Juliet character into a character that I LOVE, she is strong and sees that her love for Romeo 700 years prior was just teenage fantasy. In short, I want to high five this Juliet and not slap her! I also really loved Romeo, he was totally the semi-crazy bad guy that was also secretly sweet and just yum. It was also so cool how Stacey Jay alluded to Mr. Willie Shakes and his part in the original story.. When I first read this I thought that it was a standalone novel but after perusing through Stacey Jay’s website it looks like a sequel titled Romeo Redeemed will be coming out this year! I am pretty intrigued to see where Jay takes Romeo and I am excited to see him in a softer light. This entry was posted in Reviews, Young-Adult and tagged fantasy, retellings, romance, William Shakespeare. Bookmark the permalink. I thought that the concept behind this book was so unique, and well, awesome! It did get kinda cheesy, but I agree that Stacey Jay did such a good job of redeeming the character of Juliet in my eyes (who was probably the first character to convince me that love at first sight does not exist and that teens are stupid). I'm not sure how I feel about the sequel tbqh, but I'm sure I'll read it!